Complex Says: That's seven-time MotoGP World Champion Valentino Rossi. He's a man who had never, ever missed a Grand Prix during his career...until he broke his leg in a nasty crash during practice at Mugello, his home circuit. That was in June 2010. Doctors thought he'd take at least six months to recover--and possibly not come back for the remainder of the season. 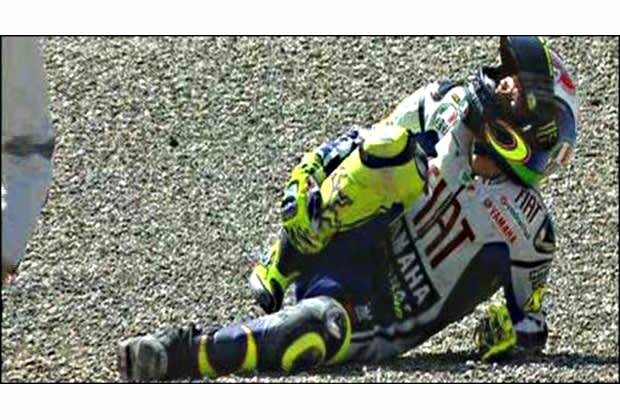 Rossi didn't win seven world championships by lying down and doing nothing. He started doing everything he could to recover, including therapeutic exercises in swimming pools to keep mobility in the leg. Sure, he did have to wobble out to his bike on crutches at the German round of the 2010 MotoGP season--but he managed to finish fourth only five weeks after breaking that leg.